Amidst all the controversy currently surrounding director Quentin Tarantino, his latest film The Hateful Eight has managed to put out a second trailer ahead of its Christmas release. I'm going to be 100% honest: I haven't seen many of Tarantino's films. But that will definitely change before this movie is released. So what is mainly drawing me to this movie? The fact that Tarantino is such an acclaimed director. However, I have seen two trailers for The Hateful Eight now, and I am not really compelled by the trailers. They're not enticing to me. Like I said before, Tarantino himself is what is drawing me to this film. I think that may be the same for the rest of the general audience. The one thing that stood out about this second trailer was definitely the cinematography. There are some artistic and beautiful shots in this trailer, and that is something I think will ring true about the film. It will be gorgeous to watch, especially in 70mm, which I intend on seeing it in. The characters also look like they'll be dynamic and well developed. Tarantino's unique style can be off-putting, but I think it's something you get used to as you watch the film. I watch these trailers, and I still have a big lingering question as to what this movie is even going to be like. I see the trailers, but they don't really offer a clear look at the plot, characters, motivations, etc. In a way, that is refreshing in an age where trailers spoil everything. It is also aggravating, as I would like to know a little bit more about what I am getting myself into. Regardless, I will be going out to see The Hateful Eight with hopes to be blown away by Tarantino. What do you think? 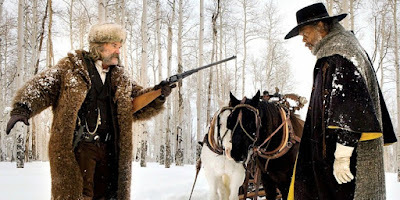 Did you like the trailer for The Hateful Eight? Are you looking forward to seeing the film? Leave your thoughts in the comments section below.